NetEnt are known for bringing well designed and exciting slot games, so their 2018 addition Lost Relics had us pretty excited. Head on a journey into a dark and spooky temple, where your only light is a flame from a torch and you never know what creatures or bonus features are around the corner. 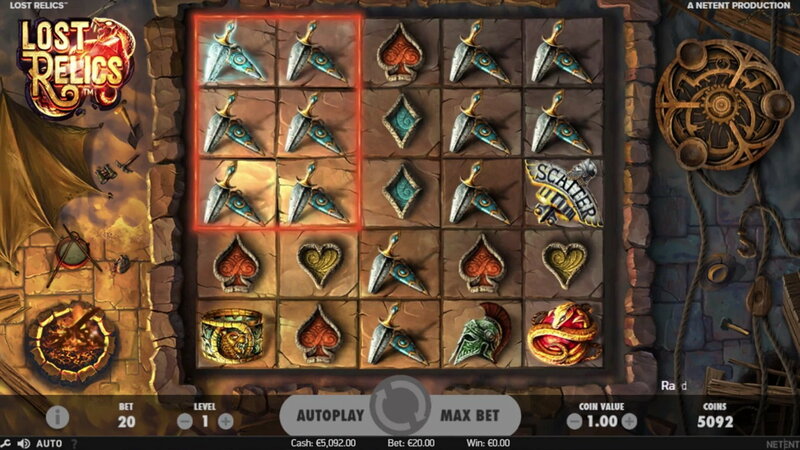 Lost Relics is a 5-reel, 5 row slot offering cluster pays instead of pay lines. So, if you can get yourself a cluster of 6 matching symbols or more, then you are going to be winning. An interesting RTP of 96.3% is on offer for all adventurers who dare to journey through the game, alongside an array of features that will blow you away. Higher paying symbols include a snake around a red ruby, a bracelet, a Roman helmet and of course a dagger. Your lower value symbols are represented in Lost Relics by the card suits, which are spades, diamonds, clubs and hearts. Bet Amounts – Betting on Lost Relics begins at just 20p per spin and can be increased to the maximum of £40 per spin, making the game itself very affordable for all pockets. To increase or decrease your stake, you need to adjust the coin level or coin values found on either side of the spin button. Wild Symbol – There is actually no wild symbol in the main game, however a wild does exist over in the features. It is depicted by the letter W surrounded by a snake and will substitute for all other symbols except the scatter. Scatter Symbol – The scatter symbol is designed to look like a Roman Emblem etched in stone. Land three of these on reels 1, 3 and 5 to trigger the bonus spins. Random Features – As mentioned previously there is no wild in the base game of Lost Relics, however you may be in luck with the random features. Every time you have a winning cluster, you may be in with a chance of triggering one of the below extra features. Coin Win – if this triggers you will be awarded a coin amount of between x3 to x30 your stake amount. This will be added to any wins you received from that spin, making bigger wins a higher probability with this feature. Extra Wild – when this triggers you can be awarded 3 extra wilds onto any position on the reels, that is not already holding a wild or a scatter. Once the wilds are in place any further wins created by the new symbols are accumulated and added to your current win amount. Extra Scatter – one of the symbols in the winning cluster will turn into a scatter if this feature triggers. This means if you are waiting on one more scatter to access the bonus spins, this will come in handy. Coin win – you will be allocated a coin amount of x3 to x30 your stake amount. We want to go out and be treasure hunters for real after playing Lost Relics. As for the game it is very well designed in both imagery and game play. The fact that it looks almost steam punk in design as the screens separate and move between the features was a big draw, as it gave a lot more to look at other than the reels. Wins came often enough, and the features were very profitable and despite the lack of a wild in the actual base game, it didn’t have a negative impact as we thought it might. 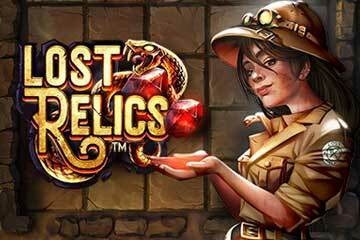 If you like Indiana Jones style movies, then Lost Relics is definitely a game you are going to want to play.